Chichester finished their Sussex Cross Country League campaign at Bexhill – emerging with individual and team medals after a hard-fought season. After overnight gales had brought down an number of trees on the course, it was the efficiency of host club Hastings AC that meant the fixture was able to start on time, with high winds buffeting the runners on the exposed parts of the course. With Liam Dunne and Ned Potter in recent good form, the club’s under-17 men knew a solid all-round performance was all that was needed to secure team medals. In the end they excelled themselves by finishing just one point behind league winners Hastings on the day and in a very comfortable third place overall. Dunne allowed the leading pack to gain a few metres in the early stages but used his strong finishing speed to overhaul all but the eventual winner, Ethan Fincham from Worthing-based Team Synergy. Fincham will run in the Chichester Corporate Challenge in a couple of weeks so the pair’s rivalry will be resumed towards the front of the senior A race. Potter was equally impressive in a close fifth and like Dunne, he justified his selection for the Sussex team for the National Inter-Counties UK championships in March. Alfie Spurle had a good run in 19th followed by a brave run from Harry Sage, feeling under par, in 23rd and improving David Bisatt in 24th. The squad’s three-match total of 110 points was not quite enough to overtake Crawley in second spot but put Chichester well clear of the rest. Before the fixture, Chichester’s aim was to keep both the men’s and women’s senior teams in the top flight and despite a weakened men’s squad, they claimed success on both fronts – the women by some margin but the men by the skin of their teeth. In both cases this was achieved thanks to the youngest members of the senior part of the club, with under-20s filling all the top four places in the men’s race and three out of the top four women to finish. First to cross the line for the women was 18-year-old Alice Cox-Rusbridge, who continued her fine winter season by winning the overall Sussex League title, the club’s only individual gold of the day. 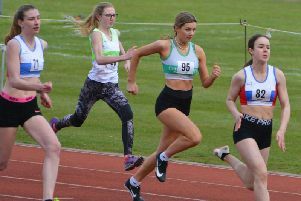 Her 15th place overall at Bexhill made her runner-up among the under-20s and gave her the Sussex lLague title from Becky Smart of Hastings. Next home for Chichester was Maggie King, just 16 years old and fifth under-17 to finish in 22nd overall. The surprise of the team was Rachel Laurie in 50th, fifth under-20, which gave her a deserved league bronze medal. Under-23 Sophie Wright closed the scoring team in 56th place to ensure division-one status next season. Running for an incomplete veterans’ team were Amanda Godfrey in 72nd overall and Sue Baker in 81st. In the men’s race, Leo Stallard had his best run of the season to finish tenth among the seniors closely followed by fellow under-20 Ben Morton who had shown his form the previous weekend with a top 100 placing in the British Universities championships in Devon. Two more of Chichester’s under-20s packed well at Bexhill, with Brodie Keates in 40th and Oliver Shergold in 60th. Paul Stallard flew a lone flag for the club’s seniors and veterans in 87th place and despite missing their sixth scorer, Chichester clung on to league safety in sixth place out of the eight top-division teams, in no small part assisted by a weakened Crawley team who could not take advantage of Chichester’s depleted squad. There was disappointment for the under-13 boys who were lying in bronze position before the race but were without two of their top three on the day, both Harvey McGuiness and Fionn O’Murchu unable to run. Hal Edgar led the squad on the day and had an encouraging run in his first race back from injury with ninth place in a good quality field. The other three Chichester runners all performed with credit and all three will be in the same age group next season. Josh Dunne led the trio home in 30th, closely followed by Sam Tonks in 32nd and Josh Eaton in 37th. Despite their best efforts, they were just overtaken by a strong Brighton & Hove team to narrowly lose bronze by a mere 14 points over the season. The club’s under-13 girls have been improving all season and Chichester were able to field two complete teams for the first time. Sisters Laila and Lillie Hellyer decided to step up an age group for this fixture from the under-11s having reached their 11th birthday, which is the qualifying requirement for the under-13s. They were rewarded with 15th and 22nd respectively in a strong field, with Isabel Isitt completing the A team in 30th followed by Grace Eminson in 37th, Gemma Appleton 38th and Marcie Faggetter in 40th for the B team. For the under-15s the girls’ squad comprised Cerys Dickinson in 14th, Tamsin Anelay in 23rd and Nicole Boltwood in 25th with reserve Rose Potter in 29th. Archie Sadler was the club’s only competitor in the under-15 boys’ race and had a good run in 20th. The day had started with the under-11s, with Millie Isitt 14th and Martha Eminson 20th in the girls’ race and Sam Cato 20th in the boys’ race.